With my birthday less than two weeks away, the count down is officially on, and today I'm sharing a few things from my wishlist. I'm very pleased to say that I made it through the entire month of March without shopping, and that feels really good. I've tried shopping bans before and usually end up succumbing to temptation - which isn't to say that there wasn't any this time, but I managed to walk away. While I won't be continuing the ban this month - what birthday would be complete without a little treat to myself - I would like to challenge myself to only shop with gift cards. I've still got a few left over from the holidays and will likely receive a few as birthday gifts. 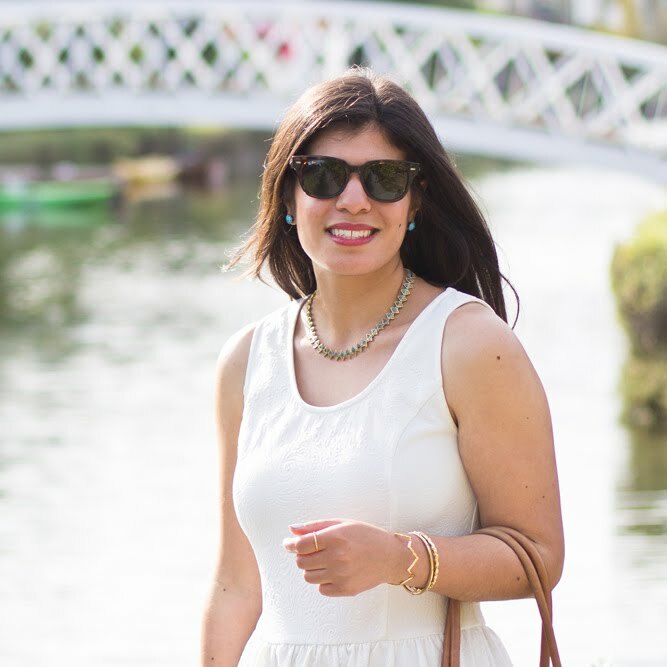 What is more enjoyable than guilt free shopping anyway? Free shopping is definitely the best! My birthday is in less than two weeks as well and I need that desk organizer! That thing is perfect. Congratulations on making through a full month long shopping ban! It's been a while since I've done anything similar, although I have to say that my desire to shop has been a little bit lower since returning from Paris - maybe I'm growing up? I doubt it. Still, good for you for sticking with it - you've definitely earned a little birthday treat to yourself. And that hedgehog organiser, my goodness, how adorable! If only I had any space on my desk, I would be adding one to my life for sure. Happy almost birthday! Congrats on making it a full month! But yes, you definitely need to treat yourself during your birthday month. Loving your picks here! The sunnies and mules are perfect. HAPPY EveryDAY and Congrats on being You! Desk organizer is so cute! Congrats on pulling through your March shopping ban ! And if it were me, I'd be the mules or the sunnies. It's proven there is nothing really to help you organise a desk no matter how cute! Happy early birthday! The Hedgehog organizer is super cute! The hedgehog and the mules are my favorites out of these pieces. Congrats on not shopping in March! I did some damage in march, but mostly because our weather got really hot and changed quickly. I'm making april my lay-low month. I've purchased two pairs of shoes so far, so we'll see how the other 30 days go. Happy early birthday! I always make birthday lists and then no one ever gets stuff off of it so I end up buying it myself...haha. Congrats on not shopping in March! You definitely deserve to splurge a little in your birthday month! Oh my goodness that little hedgehog is so cute! Love those sunglasses too! 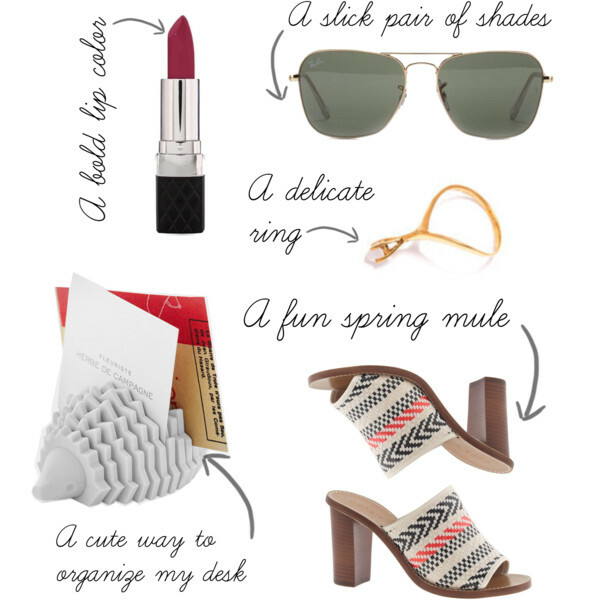 That desk organizer is adorable and I love those printed mules! Early birthday wishes to you! yea no ban on your birthday month, great list! Way to go for making it through March without shopping! But I agree, you MUST shop on your birthday month :) I love all these picks, especially those mules and that adorable hedgehog mail sorter! Happy early birthday, great picks!!! Awww such great wishes - hope you have a good one!!!! The hedgehog card holder is soo cute. Yay! Birthdays are the best! I hope you get everything on your wishlist! Love that delicate ring. Yay, I'm counting down to my birthday as well! I can't wait. Those spring mules are absolutely gorgeous by the way. Hope you get them.